This historic lodge is located on the shore of Twin Lakes and surrounded by mountains and skiing. The lodge was built in 1924 and provides seasonal bike and boat rentals. Tamarack Lodge rooms are located in the main lodge. The cabins are equipped with a kitchen and fireplace. This Mammoth Lakes resort offers guests mountain bike lessons, guided hikes and fly fishing classes. 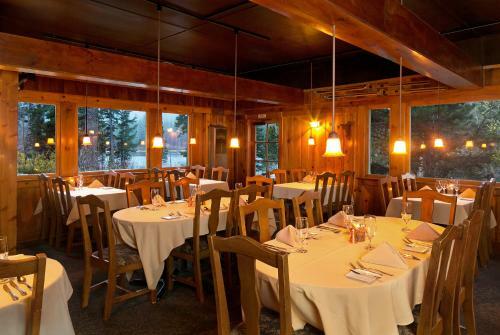 Guests at the Tamarack Lodge can dine at the Tamarack’s Lakefront Restaurant. The property also offers an airport shuttle. The property is one mile from downtown Mammoth Lakes. Yosemite National Park East Entrance is within a 45-minute drive of the Mammoth Lakes Tamarack Lodge. A full kitchen and a full living room featuring a sofa bed and a fireplace are both available in this cabin. An en suite bathroom and a guest bathroom are provided.